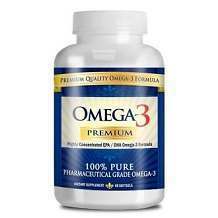 Omega-3 is an important element that needs to be present in the body as it is required for normal bodily functions. Since it is not naturally synthesized by the body, it has to come from our diets. Majority of people do not realize that they are deficient in Omega-3 fatty acids, as our diets tend to have more Omega-6 and Omega-9 than Omega-3. Children need adequate quantities of Omega-3 fatty acids, and that is why Nutrition Now has created Omega-3 Gummies for kids. Nutrition Now Omega-3 Gummies are tasty and fun, thus enabling kids to enjoy the flavour while getting the required Omega-3 fatty acids. The main ingredients contained in Omega-3 Gummies are listed below, though the amount of each ingredient used is unknown. Alpha-linolenic Acid (ALA) – This essential fatty acid reduces high blood pressure, prevents hardening of the walls of arteries, reduces cholesterol, and keeps heart attacks at bay. Eicosapentaenoic Acid (EPA) – Studies done on EPA have not proved that it can improve mental, physical, and emotional health. Docosahexaenoic Acid (DHA) – There is no proof that DHA has the ability to reduce bad cholesterol. Omega-3 Gummies have a recommended dosage of 2 gummies to be taken each day. 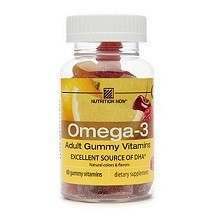 A lot of research was done on Nutrition Now Omega-3 Gummies, but there was no clearly indicated price for this product on the product website. Prospective customers who want to purchase this product must either do so from another website or search for a store that stocks it. Buyers wishing to purchase Nutrition Now Omega-3 Gummies must be aware that this product does not come with a guarantee of any kind. There is no information on the product website that relates to a return policy or a refund in case a customer is unsatisfied with Omega-3 Gummies. Nutrition Now Omega-3 Gummies has a nice taste that is sure to appeal to children. It also contains essential fatty acids that are good for bodies that are growing and developing. However, the product manufacturer has neglected to give any information regarding the amounts used for the ingredients. Considering the fact that Omega-3 Gummies are designed for children’s consumption, it is important that this information be available on the product label. Some of the main ingredients have also not been proven to be beneficial to mental, emotional, or physical health. Omega-3 Gummies do not have a price listed on the website making it difficult to know how much you are spending on it, let alone compare prices with other products. This product does not come with a guarantee or return policy, which is unsatisfactory for a children’s product.